Neither the timing or rationale seem readily apparent, but the Saint John Sea Dogs have snipped one of the remaining links to their Memorial Cup championship by sacking coach and general manager Mike Kelly. The Sea Dogs are next to last in the Quebec League with a 5-10-0-2 (.353 point pct.) record at the quarter-pole, but that doesn't fully explain away the decision. It was established going into the campaign that Saint John was in the second season of restocking its roster after having a decorated three-year run from 2009-12, when it was led by current Florida Panthers forward Jonathan Huberdeau. But with the team mired in an eight-game winless streak and unable to get untracked offensively, averaging just 2.24 goals (ahead of only cellar-dwelling Shawinigan, who ironically ended Saint John's hope of a Memorial Cup repeat in 2012), the ax had to fall. "Mike Kelly is a man of integrity, and decisions like these are never easy," said Sea Dogs' President Wayne Long. "It is our duty to do what we feel is in the best interest of our team. We will always be grateful and appreciative of what Mike has done for the Sea Dogs' organization." The Sea Dogs expect to name a new head coach in the coming days. The move seems to have taken many people by surprise. Why make a shake-up this early in the season? Whoa, I was not expecting this. Sea Dogs part ways with coach/GM Mike Kelly. One semi-plausible explanation is that there was a dissatisfaction with the rebuilding process and the Sea Dogs decided Kelly wasn't part of the solution, which usually means someone becomes part of the problem. Saint John is carrying 11 players in the 1996-97 birth-year cohorts, so 17 games is really too small a sample to determine whether a young group doesn't have a collectively high ceiling. So I'm not sure if that checks out. That brings it around to timing. If this is being done at the end of October, whoever dons the GM's hat can have a month-plus evaluation period to decide what to do before the QMJHL's trading period begins shortly before Christmas. The Sea Dogs expect to have a new coach relatively soon. Mike Kelly has done great things for hockey in New Brunswick. 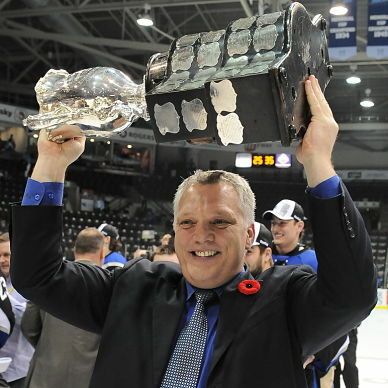 He was the associate coach under present-day Montreal Canadiens assistant coach Gerard (Turk) Gallant from '09-12, when the Sea Dogs became the first QMJHL team to have three 50-win regular seasons in a row and also became the first to bring a Memorial Cup title to the Maritimes. He also won a University Cup with the Fredericton-based UNB Varsity Reds. Of course, he had only one set of fingerprints on the schematic for Saint John's salad days. A lot of credit also belonged to Gallant, then-head scout Norm Gosselin and even Kelly/Gallant's predecesor, Jacques Beaulieu. Saint John also lost out on landing the big prize at the 2012 trade deadline, when Memorial Cup host Shawinigan landed two-time national junior team defenceman Brandon Gormley in a deal with the Moncton Wildcats. That could have left a lingering impression, since Gormley helped the Cataractes win the year-end tournament. So it's believeable if the Sea Dogs decided any halo effect Kelly had from his connection to the championship years had worn off.